Cruelty towards animals is simply never acceptable, and something we all must collectively stand strongly against. When I came across this horrifying story out of New York, I was shocked and felt a loss of hope in humanity. 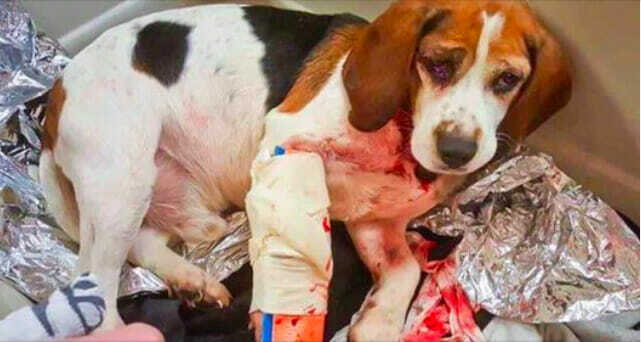 Two beagles were discovered on the side of a highway, one severely injured, after they were literally thrown out of a moving vehicle. The monstrosity of such an act is hard to take in — but there is a silver lining: the heroes who stepped in to save the dogs’ lives. 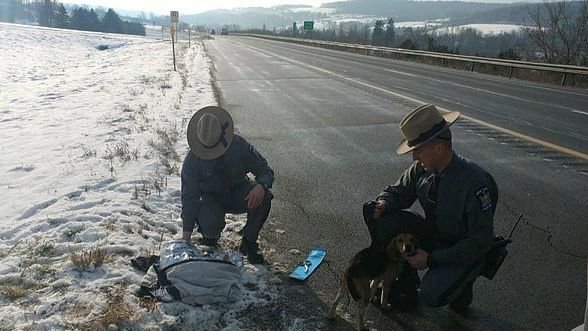 New York State police officers came across an abandoned tractor-trailer on the side of the road and stopped to check in. That’s when they discovered a horrifying sight: a man was carrying an injured dog, with another following closely behind. It turns out that, just moments earlier, both dogs had been thrown out of a moving vehicle. The driver of the tractor-trailer, a man named Adam, had observed the horrifying scene unfold and immediately stopped his truck to bring the abandoned dogs to safety. 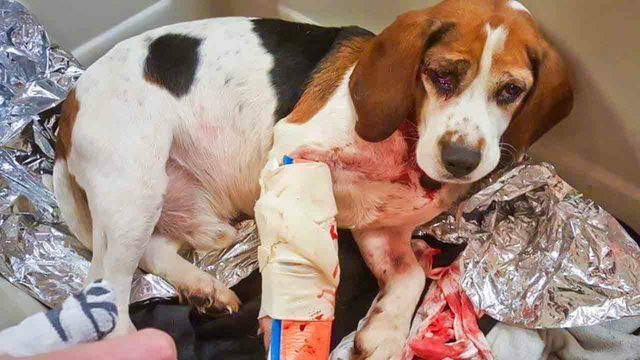 The police called in a K-9 handler who helped bandage up the injured beagle to stop his bleeding and both dogs were soon taken to the Broome County Humane Society. Upon examination by a vet, the dogs were determined to be around 1 and 7 years old. They were soon named Trooper and Adam, after their heroic rescuers! A vet examined Trooper and Adam. Poor Trooper had suffered an array of injuries as a result of the cruel act, including a compound fracture of his distal radius, broken ribs and contusions to his lungs and shoulder. But most tragic of all that his front right leg needed to be amputated. Trooper will now require assistance to get around and potentially require a harness to stabilize him, Amberly Ondria from the Broome County Humane Society told The Associated Press. “He has quite the road to recovery ahead of him,” she said. The police are now seeking information to help apprehend the monsters who did this. The beagles were discovered along Interstate 81 near Whitney Point — anyone with information is being asked to call the New York State Police at (607) 749-1614. This is absolutely appalling! I really hope they catch whoever did such a terrible thing and swiftly punish them. But I am so glad that Adam and the trooper stopped to save these poor animals’ lives. There is hope after all!